SPAIN: Spain's once roaring wind industry is stalling and will slow to a crawl if the government does not streamline approval of wind power projects and set ambitious, longer-term targets for installed capacity, national wind association Asociacion Empresarial Eolica (AEE) says, ending a period of rapprochement with government regulators. Adding to the wind sector's gloom is the realisation that a recent government allocation was not as large as it first appeared. Last May, wind projects were halted after the industry ministry required central government approval for all new projects that were not yet registered as fully operational. Without approval, projects were not eligible for wind power production incentives. AEE estimates that 5000 jobs directly related to wind were lost during the half-year freeze on building projects following that decree. In November, the government said it would approve 6.4GW of 14GW of pending wind project applications. Dates of commissioning for the projects stretched to end-2012 (Windpower Monthly, January 2010). Though Spain's wind sector initially greeted the allocation as evidence that its frozen market was thawing, optimism has faded. The 6.4GW is not enough to sustain the industry, claims AEE president Jose Donoso. Without firmer support from government, AEE reckons Spain's wind manufacturing base will shift abroad. Warmer relations between the wind sector and regulators followed the government's November announcement. The AEE was relieved that the 6.4GW allocation was not much lower, as it had earlier feared. 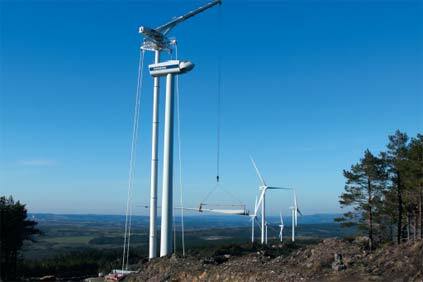 Another welcome development was the extension of the production incentive for new wind capacity. A 2005 renewable energy plan had set 2010 as the final year for that incentive, but the November allocation extended the support through the end of 2012. The AEE was also cheered by the new 23GW target for total cumulative wind power capacity by end-2012, compared to the 20GW by 2010 earlier stipulated. The wind industry publicly welcomed the two-year breathing space, but with reservation. "Wind plants take up to seven years to develop," says Donoso. "We need at least five years' regulation visibility if we are to keep financiers and investors onboard." The honeymoon soon ended. Wind firms at first believed the 6.4GW comprised new projects, as ministry communications had implied. But AEE says information reveals that just over 4GW of the allocation is actually for projects already under construction - or, in some cases, already online - meaning demand for new turbines will be much lower than initially believed. The remainder of the allocation will result in average annual turbine orders of just 780MW, 37% below the 2.1GW annual demand in 2004-2008. Moreover, AEE has identified 660MW of wind capacity that was under construction or completed as of April 2009, but not commissioned - and thus ineligible under the rules established in May for the statutory wind power incentive. AEE declines to reveal a breakdown of how much is built or under construction, but offers as an indication that a handful of projects scheduled under the register to connect as late as 2012 are already producing power. Developers should not be penalised under the new rules, says Donoso. "Projects advanced under legally binding regulation in place before the rules suddenly changed in May, regardless of contracts and supply chains already set in motion," he says. For AEE, negotiating a special arrangement for the excluded 660MW is top priority, especially as it is still unknown whether that capacity will receive permission to feed power into the grid even at non-subsidised electricity market rates. At a forthcoming meeting, AEE also plans to urge the ministry to publish by the end of March a draft regulation for a new support mechanism for wind after 2012. Further demands include wind allocations at average 2004-2008 levels of 2.1GW a year. Furthermore, AEE wants the government to set a 45GW wind target for 2020, including 5GW offshore - a level of commitment the wind industry says is required to comply with the EU's Renewable Energy Directive. Rebuffing wind industry complaints about last year's hiatus, energy secretary Pedro Marin last month insisted that wind and other renewables have not suffered paralysis. Rather, he said, they have exceeded targets set in 2005. The AEE acknowledges that installed wind capacity is 13% beyond Renewable Energy Plan targets. But it rejects any suggestion that the wind sector is bloated, drawing comparisons to solar photovoltaic and solar thermoelectric capacity that it says exceed targets by 1089% and 368% respectively. Wind produced 44% of all renewables generation in Spain in 2009 while only using 22% of all renewables production incentives paid by the electricity system, says AEE. In contrast, the two solar technologies combined accounted for just 9% of total renewables generation but received 48% of total renewables incentives in 2009, it says. "Wind has proved its sustainability," says Donoso. "The minimum we and the EU require is 2.1GW of new capacity a year."